Watching the World Cup has been so exciting! Australia is playing the Netherlands. Thought I would make some game food to make the game even MOORE exciting. Best part of the game…right? 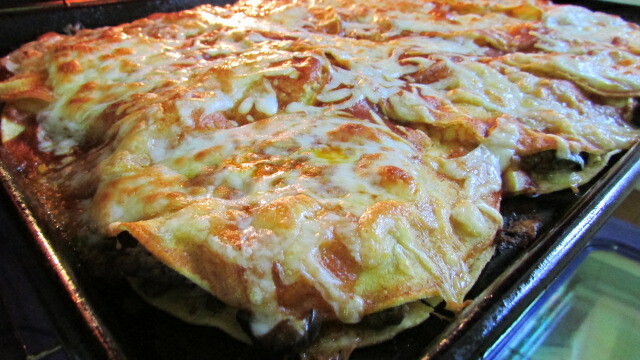 These enchiladas are a cinch to put together, no rolling necessary, no frying tortillas, cuts way back on the calories! So delicioso!! Preheat oven to 400 degrees F. Spray large cookie sheet with Pam Vegetable Spray. Set Aside. In a skillet add olive oil over medium heat. Add veggies and saute for 5 minutes. Add ground beef, cook until brown, drain fat. Add 1/2 can of enchilada sauce to meat and veggies. Set aside. Place one layer of corn tortillas on cookie sheet. Cover tortillas with meat mixture. place remaining tortillas over meat mixture. 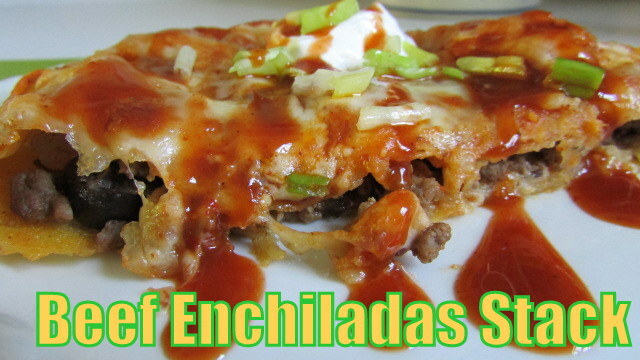 Pour remaining enchilada sauce over tortillas, cover with shredded cheese. Bake in oven for 15-20 minutes or until golden brown and bubbly. Slice and serve with a couple shakes of Cholula sauce and sour cream. Wishing you could deliver this to me right now Nettie!! That looks so very good, love it!! !